The wide rubber Stay Band wraps around the seat stay to hold the chain scrubber in place. This means you don't have to hold the scrubber in place with your hand when you clean the chain. This chain bath enables you to clean your bicycle chain in situ with maximum speed and minimum fuss. 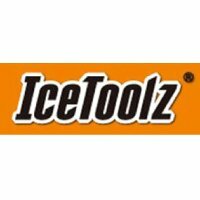 The Ice Toolz Chain Scrubber can be used on any bike with a rear derailleur. Being smaller, the Ice Toolz Chain Scrubber is easier to use to clean chains on bikes without rear derailleurs, such as singlespeeds and hub gear bikes, whose shorter, tighter chain length presents less room to use a conventional-sized chain bath. The Ice Toolz Chain Scrubber incorporates 20 brushes and a four-sided scrubber to clean every link of your chain - top, bottom and sides.